Come to the July meeting and meet up with your Pocket neighbors! We’ll be talking about National Night Out and hear from our neighborhood police officers. Join us at the Humboldt Rec Center on Tuesday, July 10 at 6:30 PM, 1045 Atlantic Avenue. Come to the June meeting and meet up with your Pocket neighbors! We’ll be talking about gardens, night out and hear from our neighborhood police officers. Join us at the Humboldt Rec Center on Tuesday, June 12 at 6:30 PM, 1045 Atlantic Avenue. Even if we are still seeing April showers, May flowers have finally arrived! Come to the May meeting and meet up with your Pocket neighbors! We’ll be talking about garden plans for the season, hear from our neighborhood police officers, and have a visit with Andy Rau to talk about city constituent services and Nancy Johns Price from the Southeast NSC office. Join us at the Humboldt Rec Center on Tuesday, May 8 at 6:30 PM, 1045 Atlantic Avenue. Well, it’s still too cold out to putter around in your yard in the evening, so why not come to the Pocket Neighbors meeting on Tuesday, April 10 at the Humboldt Rec center? We’ll meet at 6:30 to discuss Garden Cleanups and hear from a city representative. Admittedly, there are a few snow flakes floating outside this morning, but spring is coming to Rochester, it always does. Eventually. On April 21st at 10:00 AM, you can join the Pocket neighbors in celebrating spring and helping to clean up the gardens. Coffee and donuts have been promised. Meet at the Linear Garden (between Mayfield and Main). Work will be done there and at the Emmighausen Garden on Heinrich St.
What do you like about your neighborhood? The City of Rochester is building a new Comprehensive Plan dubbed “Rochester 2034”. The significance of 2034 is that it will be Rochester’s 200th birthday. “Rochester 2034 will serve as the fundamental basis for making public and private decisions on land use regulation and development, future investment, and the allocation of critical resources.” The plan is intended to promote the general welfare of the people and provide guidance for the future development of the city. You can provide input by participating in the survey or attending one of the many public meetings around the city. When did you say the meeting is?? ≈ Comments Off on When did you say the meeting is?? The Pocket Neighbors will be meeting on the second Tuesday of the month at the Humboldt Rec Center. On Atlantic. We’re also changing the time to 6:30 to make it easier for the safety officers to join us. The March 13th meeting will focus on strategy and plans for 2018. 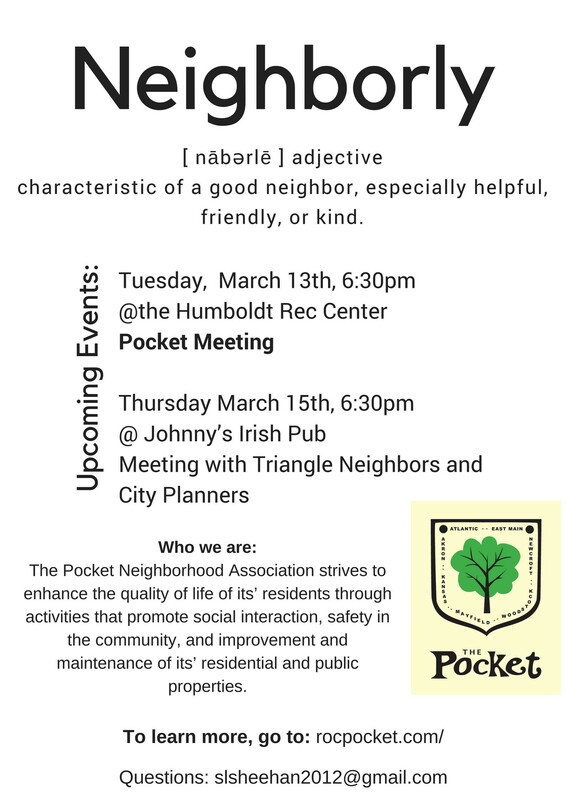 The Pocket Neighbors will be meeting at the Humboldt Rec Center on Tuesday, February 13, from 7:00 to 8:00 PM. The Pocket Neighbors will be meeting at the Humboldt Rec Center on Monday, January 8, from 7:00 to 8:00 PM. Flower City Habitat for Humanity is in the Neighborhood! ≈ Comments Off on Flower City Habitat for Humanity is in the Neighborhood! Flower City Habitat For Humanity helps put people in affordable housing. Qualified Habitat families go through rigorous orientations and provide sweat equity by helping to build or working in other capacities for Habitat. 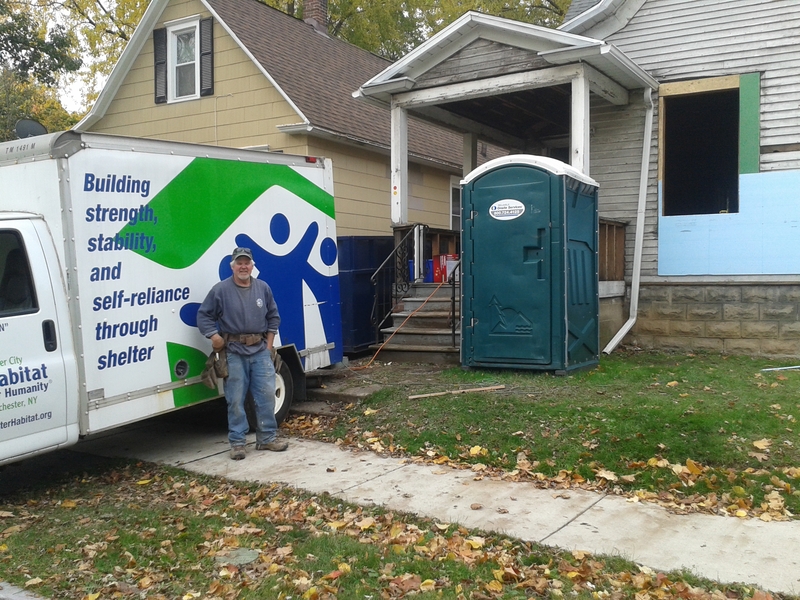 Habitat has been helping to build and renovate affordable housing in Rochester since 1984. Click the link below to learn more about Flower City Habitat.